This Guardian Netsecure Antivirus 2015 has a number of advanced security features offering your PC multiple layers of protection. The software ensures that your system is protected from all types of malware, spyware and phishing attempts and thus gives you a safe and secured platform for browsing, social networking or online shopping, banking, etc. The security suite includes antivirus, antispyware and anti-malware tools along with Firewall with Stealth Mode that runs in the background and scan all incoming and outgoing traffic for potential dangers. Guardian Netsecure is loaded with many advanced security features that will turn your PC into a completely safe platform for all types of online activities. Its antivirus, antispyware and anti-malware tools prevents all malicious programmes for reaching your system and thus keeps your personal and sensitive data out of reach of unauthorised access. There is a special Auto Hijack Restore feature that will allow you to restore your system in case of a virus attack. Apart from a firewall with stealth mode that keeps running in the background, there are facilities like browsing protection, USB drive protection, boot time scan etc. that will always keep your PC safe and secured. 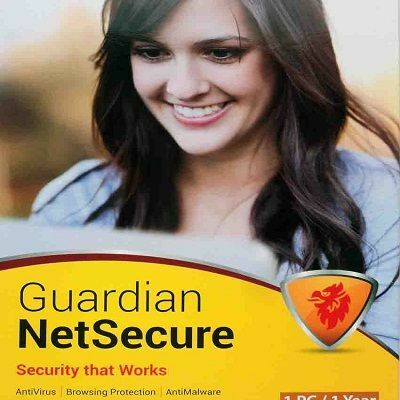 The Guardian Netsecure Antivirus 2015 is compatible with Windows PCs only. Operating systems those allow installation of this antivirus are Windows 7, 8, 8.1 and Windows 10. For installing this antivirus product you need to have a 1Ghz or Higher Processor and 1GB RAM. There must also be 2.15GB of free hard disk space and a DVD drive.